PWI Tag Team of the Year award in 1979 - with Ivan Putski. PWI ranked him # 51 of the 500 best singles wrestlers in the PWI 500 in 1995. PWI ranked him # 93 of the 500 best singles wrestlers during the PWI Years in 2003. PWI ranked him # 70 of the 100 best tag teams during the PWI Years with Rick Martel in 2003. ↑ 1.0 1.1 1.2 1.3 1.4 1.5 1.6 1.7 "Tito Santana Profile". Online World Of Wrestling. สืบค้นเมื่อ 2010-06-04. 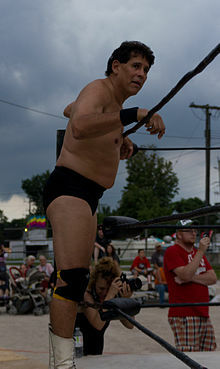 ↑ "Tito Santana Hall of Fame profile". WWE. สืบค้นเมื่อ 2011-03-31. ↑ 3.0 3.1 3.2 3.3 Royal Duncan & Gary Will (2000). Wrestling Title Histories (4th ed.). Archeus Communications. ISBN 0-9698161-5-4. ↑ Meltzer, Dave (2012-12-10). "Mon. update: Major Spike announcement tomorrow, Aces & 8s identity, TNA injury updates, Hall of Fame inductions announced, WWE two PPVs this weekend, Jericho schedule, Amateur wrestling hits MSG first time ever". Wrestling Observer Newsletter. สืบค้นเมื่อ 2012-12-10. หน้านี้แก้ไขล่าสุดเมื่อวันที่ 7 กันยายน 2559 เวลา 22:48 น.